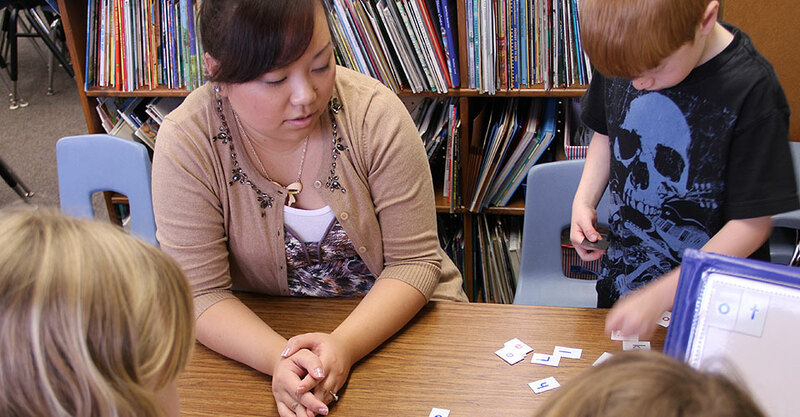 UW-Stevens Point has been preparing outstanding teachers since 1894, so it’s no surprise graduates from the UWSP School of Education are some of the most talented teachers the country. Part of the educational training includes the Elementary Methods Block, which is taken the semester prior to student teaching. EMB allows students an opportunity to spend seven weeks working full-time with a veteran teacher in an elementary school setting where the students apply the theories and methodology learned in their coursework to real-life classroom teaching. One of the partner schools, Washington Elementary School in Stevens Point, is home to numerous UWSP students each semester; we visited with three of them on Thursday, Dec. 1. UWSP student Kia Her (pictured above) worked with words in Mrs. Cheryl Behnke’s second-grade classroom, Kim Hooyman taught Mrs. Laurie Hansen’s sixth graders mixed numbers, and Marcus Kral read “Two Bad Ants” to third graders in Mrs. Jodi Tuskowski’s class. Watch as Marcus and Kim take the lead in their classrooms.